ScreenDance will continue celebrating with dance film both during juli and august. This time we celebrate in collaboration with Dansmuseet during Stockholm Pride Festival (July 25 – 31th) as well as during Kulturfestival (August 16 – 21th). Check out the program here! 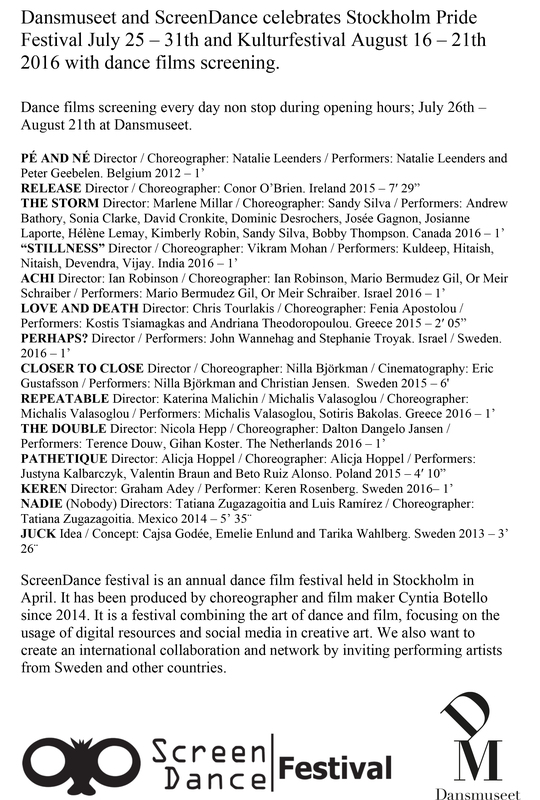 Dance film at Balettakademien in Stockholm 18th July-19th August 2016. During five weeks ScreenDance will present some dance films from the ScreenDance International and National Selection 2016 and some from the online competition 60secondsdance 2016. We present the winner of the ScreenDance residency Släpp by Lucas Carlsson as well as other great films such as The double by Nicola Hepp, Move away by Christian Martínez, Innocence by Sima Bonsai, Hem by Emelie Boman, Blind Faith by Lanre Malaolu and many more. ScreenDance Festival is run by Cyntia Botello since 2014 with the support of her partners and funders. It is a festival combining the arts of dance and film, focusing on the usage of digital resources and social media in creating art. ©ScreenDance Festival 2015, all rights reserved.